Great info - I grow some heirloom favas here in the eastern US, near the Canadian border. I have not found a way to cook them that I really like, so I am very eager to try this method and recipe. I'm excited to hear about your growing of heirloom favas and your desire to try the recipe mentioned. We have so many different ways of cooking fava beans in Egypt this being one of them. In Malaysia, bean sprout is called "taugeh" and best eaten fried. Yay! I'm so happy to see you back on here. :) Great post! I'm going to have to work in fava beans here somehow. They are really healthy for you. Thanks for the suggestions! It's very interesting to know the word for it in Malaysia. It's nice to know it's present there. I love Malaysia although I did not visit it yet. Yes it's been long since I last wrote here although I get many ideas to write about I just need to get myself to do it. 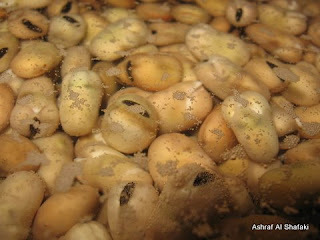 Yeh fava beans are very healthy in different forms, sprouts in particular have high nutritional value as you well know. You may already know this, but I thought I'd share it. Fava beans are a great "green manure" to enrich your soil. You grow them until they are 10-50% flowering then dig them into the soil. By doing this, you capture the maximum amount of nitrogen in the plant and transfer it to the soil through the root nodules. This will feed your soil and condition it for better plant production. Thanks a lot for this wonderful information. Thanks a lot for sharing it with everyone here. I am aware that legumes in general and fava beans in particular are very good green manures. I've planted fava beans in my pots and turned them in the soil for this very reason. Not only do they provide a rich source of nitrogen(nitrogen fixation) for the soil, but I found that planting them in itself loosens up the soil thus enhancing its physical properties. I did not know however the best time for turning the green manure in the soil. So thanks a lot for telling us it's after it starts flowering as sometimes I did not wait till they flowered. I'll make sure next time I'll select better timing for maximum nitrogen fixation. I've heard of this, and others have asked me about it on my blog, but never tried myself. It sounds really tasty. Yes it's lovely and the 'soup' is very nice with lemons on it specially during cold winter days, it helps keep you warm. I learned a lot about fava beans here: I already knew that they are good green manure and have attractive fragrant black-and-white flowers; I'd also eaten the beans roasted in oil like peanuts, very tasty. I hadn't thought about them growing in Egypt or Malaysia as they are a cool-weather crop here. I must try the sprout recipes, they sound good. DS, great comment. I've never heard of fava beans being eaten roasted in oil like peanuts nor had it ever occurred to me. Perhaps I aught to try that one day. It's an amazing idea! 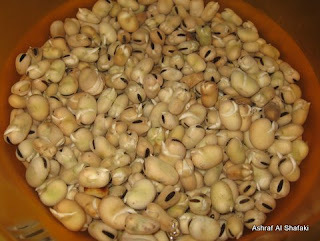 In Egypt fava beans are the main staple food for Egyptians and we cook it in so many different ways. I never knew their cute and soft looking black and white colored flowers had an attractive fragrance despite my growing some of them in my balcony. Perhaps I did not try to smell them well or the fragrance attracts specific insects only or maybe the varieties in Egypt do not have such fragrant flowers. I'll have to check next time I grow them and they flower, though I believe I do have a strong sense of smell. Good nutrition from the fava bean sprouts. Thanks for the recipe, I will try it, another way of healthy eating. Cheers! In Britain these are called broad beans. We only know the name Fava bean from Hannibal Lecter's menu selection! Martron, thanks a million for your comment. I love to know about language differences and there you've given me the usage of broad beans and that it is used in the UK. Could you please mention more about how to make sandwiches and other dishes with the beans? Fava bean sprouts are eaten after being cooked by optionally pealing each bean then eating it. Some people make them in sandwiches (without pealing the beans) flavoring them with salt and cumin. Yet beans (fuul) is more popularly eaten in sandwiches when it is cooked in a different way not as sprouts. The other more popular way of cooking it produces what we call fuul medammes. This is what is more commonly put inside sandwiches. mmmm foul and felafel 1 egyptian pound! Enjoyed this older entry very much - thank you for it. I recently had bought dry favas to see if they could be sprouted, and was amazed at how "sprouty" they became if allowed to go on and on... the oldest ones look like little pale green swans! May I ask though... you speak of them being cooked. Is that tradition or safety? I have been eating a few raw with no ill effect. Is that just luck, or because I have not eaten many? Is cooking a preference or necessity?